In the wake of the devastation caused by Hurricanes Irma and Maria, as well as the earthquake in Mexico, Bermuda-headquartered Bacardi Limited and the Bacardí family have pledged $3 million for disaster relief and recovery efforts in the impacted areas. Bacardi is designating $2 million in cash and other assistance to Puerto Rico, and the remaining $1 million to local relief agencies supporting communities impacted in Florida, other islands in the Caribbean, The Bahamas, and Mexico. “The Bacardi family, company and our employees are deeply saddened by the devastation and horrific loss caused by the recent hurricanes and earthquakes,” says Facundo L. Bacardi, Chairman of family-owned Bacardi Limited. Bacardi will provide immediate relief and longer-term rebuilding efforts in collaboration with several non-profit partners and local governments, including the Government of Puerto Rico, in the affected communities. Puerto Rico has been home to the BACARDÍ rum distillery since 1936 where the company produces its namesake brand, and the Casa Bacardi visitor center. 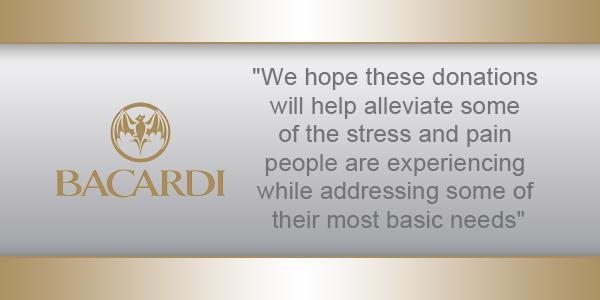 “Disaster relief aid is part of our Philanthropy & Community Investment mission to provide assistance to communities in need,” adds Mr. Bacardi. The company said that the “devastation of the recent natural disasters strikes particularly close to Bacardi since many impacted communities are considered home to its operations, offices, and employees. “In addition to operations in Puerto Rico, BACARDÍ rum is bottled in Jacksonville, Fla., and South Florida is home to the Bacardi North America regional headquarters office. “In Mexico since 1931, the company has offices and production facilities for its rum and tequila brands. While Bacardi no longer has facilities in The Bahamas, our donation serves as a testament to the people of The Bahamas where the company produced its iconic rum for nearly 50 years. This $3 million pledge is in addition to the Bacardi USA contribution of up to $100,000 to support its business partners and others affected by Hurricane Harvey in Houston, Texas.